With electric vehicles rapidly becoming more viable for long distance trips, enthusiasts like to push the limits of what their cars can do on a single charge. Two men in Denver set out to break the record distance in a Model 3 this weekend and after 32 hours, they were victorious. Unfortunately, the car is refusing to go any further. “Hypermiling” is the term EV aficionados use for getting the most juice out of their car’s battery by driving as efficiently as possible on a forgiving route. Tesla lovers Sean M. Mitchell and Erik Strait set out on Friday to firmly beat the previous hypermiling record on a closed loop near the Denver Airport. The route was about a mile long, featured an elevation change of only 10 feet, and the two drove at speeds between 20 and 30 mph. 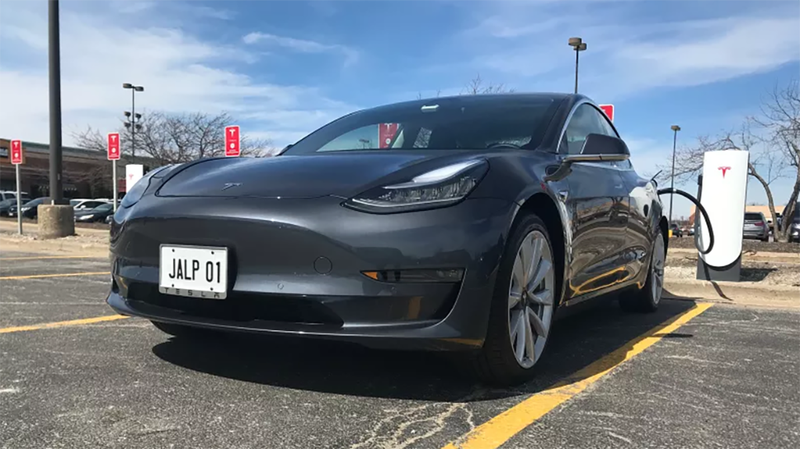 Tesla rates the Model 3's range between 220 and 310 miles on a single charge—Mitchell and Strait hoped to hit 600 miles. They livestreamed their circuitous journey on YouTube, interacted with commenters, caught Chipotle burritos in a fishing net, and 32 hours later, they blew past their goal. After driving 606 miles, the Tesla’s battery died and the two men celebrated. According to Electrek, the previous hypermiling record was 560 miles. Having earned their success, the boys hooked up the Model 3 to a Supercharger and got some rest. But the next day, after 24 hours of charging, they found that the Tesla was still not ready for the road. It wouldn’t take a charge and had to be towed away to a service center. “Service Center is not open today so status of #Model3 has to wait until tomorrow,” Mitchell tweeted on Sunday. “I’ve been assured the best hands will look into tomorrow.” Considering what a headache the Model 3 has been for Tesla recently, we’re sure the best of the best really will be on the case. To be clear, the Model 3 isn’t supposed to go this far, but the issue could be caused by any number of problems. Normally, one would expect Elon Musk to be tweeting about the amazing record these guys pulled off, but he ran into some trouble in the Twitter-sphere over the weekend and has been radio silent for a bit. We’ve reached out to Tesla and Mitchell for more information and we’ll update this post when we hear back. Update: The Model 3 is back in action. Mitchell explained on Twitter, “The 12v was replaced by Tesla service and it allowed the car to charge at high and low power. When the batter pack gets low it runs basic systems off the 12v. When 12v is depleted it cannot open pack contactors to charge.” He added that this was a fringe case and that the duo drove the Tesla around 50 miles after the primary battery was drained to zero. He said it behaved differently than his Model S in this situation but he doesn’t have any reason to believe that the Model 3 was defective.